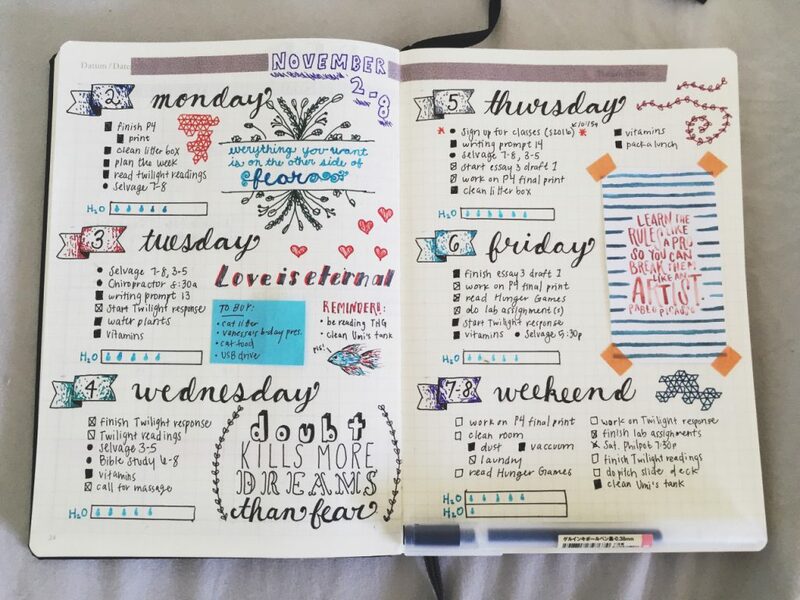 An example of a bullet journal. Journaling is a highly effective way to reflect on your thoughts, feelings, and surroundings. It’s a great tool for staying mindful and learning more about yourself. And since journaling is what you make of it, you can record however much or little you want—or even keep multiple journals! Right now, I have four journals: a bullet journal for planning purposes, a journal in which I record things to share with my therapist, a food journal to help me stay on track in my eating disorder recovery, and a theatre journal, where I keep track of the plays I read, potential audition materials, and other goals for my theatrical studies. I’ve found great organizational advantages in keeping multiple journals, but it’s a somewhat hefty undertaking, and it may not be helpful for everyone. So, what might be the benefits of keeping several journals? Keep track of multiple areas of interest. If you want to write extensively about your day-to-day life, your exercise goals, the movies you see, and the places you visit, you might feel more organized if you have a separate place to write about each topic. If you reread your journals in search of a specific topic, it might be easier to find what you’re looking for! Journal in multiple locations. If you’re always on the go, it might be handy to keep journals in several places, such as your home, your bag, or your phone, so you always have a place to record your thoughts. I store my food journal in an app on my phone, so I can add entries wherever I am. My theatre journal is also pocket-sized, so I can take it with me and add to it whenever inspiration strikes! Experiment with different formats. Trying multiple journaling techniques, even on a temporary basis, can help you narrow down the most effective methods for you. I make bulleted lists in my theatre journal and bullet journal (of course), and I write more detailed entries in my food and therapy journals. You can also use multiple journals to explore different media in an organized way, such as drawing and photography! Of course, there are several downsides to keeping more than one journal, mostly due to the time and effort of recording your thoughts multiple times. Multiple journals can be overwhelming. Journal burnout is real! I admit that sometimes I feel as though writing in my journals is more of an obligation than a hobby, a feeling that’s probably made worse by having several journals in the first place. Writing in multiple places can be pretty exhausting at times—it can make journaling feel like hard work, which is kind of not the purpose of journaling in the first place. Entries across journals can sometimes feel redundant. I write about my nutrition in my food journal and in my therapy journal, and sometimes I find myself writing the same things. This can happen if two or more of your journals overlap in their purposes. Stretching your commitment across multiple journals may affect their depth. If you devote your energy to writing multiple journals, you may feel less inclined to add more details or deep inquiry to each entry. Sometimes my goal is to simply complete an entry in my journals, which then can result in my just skimming the surface of my thoughts. If you prefer to dig deeper into your thoughts and feelings, it may be easier to concentrate on a single journal. The bottom line? Everyone has a unique journaling process, and depending on their lifestyles and personalities, different people may find it useful to keep multiple journals or to stick with just one. For me, although it can feel overwhelming at times, I’ve found it convenient to have separate spaces to keep track of different topics are important in my life. But keep in mind that there is no “right” or “wrong” way to journal, so feel free to use whatever techniques bring you the most benefits from your journaling experience! What kinds of journals have you kept? What have been the benefits and difficulties of each kind? Previous story Can Fame, Success, and Money Cure Depression and Anxiety?